The actor Ichikawa Sashô II held the name of Ichikawa Sakimatsu I from February 1883 to 1893. The actor Ichikawa Shôchô II held the name of Ichikawa Sakimatsu II from September 1896 to August 1906. Born the 26th of June 1898 in Tôkyô in the district of Nihonbashi. Disciple of Ichikawa Sadanji II, he started his career in 1906 at the Miyatoza. His two first stage names were Ichikawa Itomaru, then Ichikawa Iwamaru. He took the name of Ichikawa Sakimatsu III in 1925. He became nadai and celebrated the event in June 1941 at the Kabukiza, where he changed his stage name to Ichikawa Sakinosuke. He stopped Kabuki for a few years after WWII. 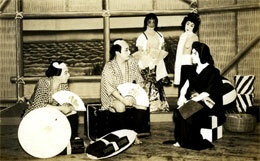 He went back on stage in 1950, as a disciple of Matsumoto Kôshirô VIII, who gave him the name of Matsumoto Takagorô. Then, he joined Ichikawa Sadanji III in 1954 and took back the name of Ichikawa Sakimatsu III. He appeared on stage for the last time in July 1960, in Tôkyô at the Shinjuku Daiichi Theater, where he performed in the drama "Onna Rôhishô". He died the 31st of July 1960. This good-spirited supporting actor was an expert in the role of horse's legs and one of his most appreciated performance was in this role in November 1952 at the Kabukiza in the dance-drama "Ômi no Okane" (the role of Okane was played by Nakamura Utaemon VI).